Come and visit our extraordinary beer indulgence seminars. 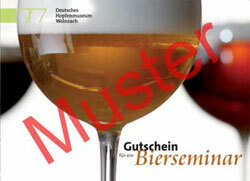 Qualified beer sommeliers will introduce you to the wide variety of tastes and sorts of beer. Only highest-quality and internationally awarded beers from the museum’s own beer cellar will be tasted. Besides, you will learn in an entertaining way some interesting facts about the art of brewing good beer. And you will hear a lot about beer which is probably news to you. When selecting the beers, we act absolutely independently without obligation to any breweries. This is also something special about our beer seminars. The main emphasis will be on enjoying the beers. Therefore we are constantly looking for new extraordinary beers. We have compiled a wide variety of seminars for you. Choose the one you like. In any case we can guarantee a unique taste experience. We are happy to organize for you a shuttle service at low cost from the train station Rohrbach/Ilm (5 km away, mainline Munich – Ingolstadt) to the museum and back, also for larger groups (phone: 08442/7574). Why not give away a gift voucher for a beer seminar. No matter if it is for one or more persons, no matter what subject. Gift coupons can be issued for any amount and the donee just has to agree with us on his or her desired date.